The Pochette by Flos is a great light fitting that will work well in modern or traditional homes. 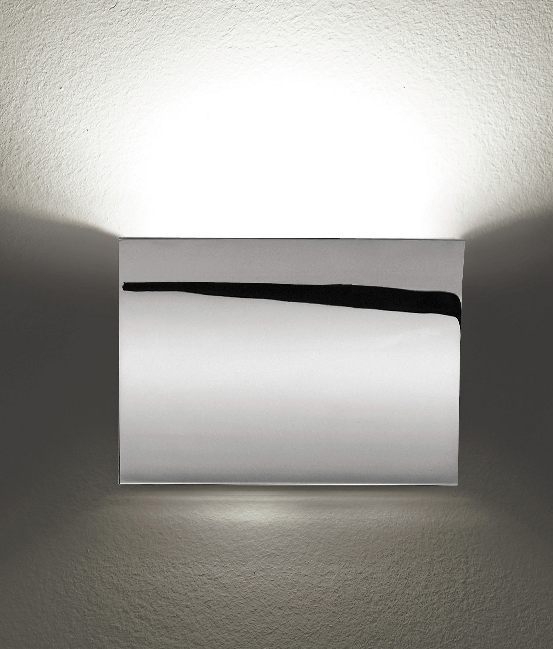 Made from cast alloy this wall light will provide mainly upward light but a slot in the base of the fixture directs light onto the wall creating a floating effect. Great for providing ambient upward wall washed lighting. The Pochette has a lay in kick deflector that directs light into the room instead of straight up onto the wall. Available in either grey, polished chrome or white. 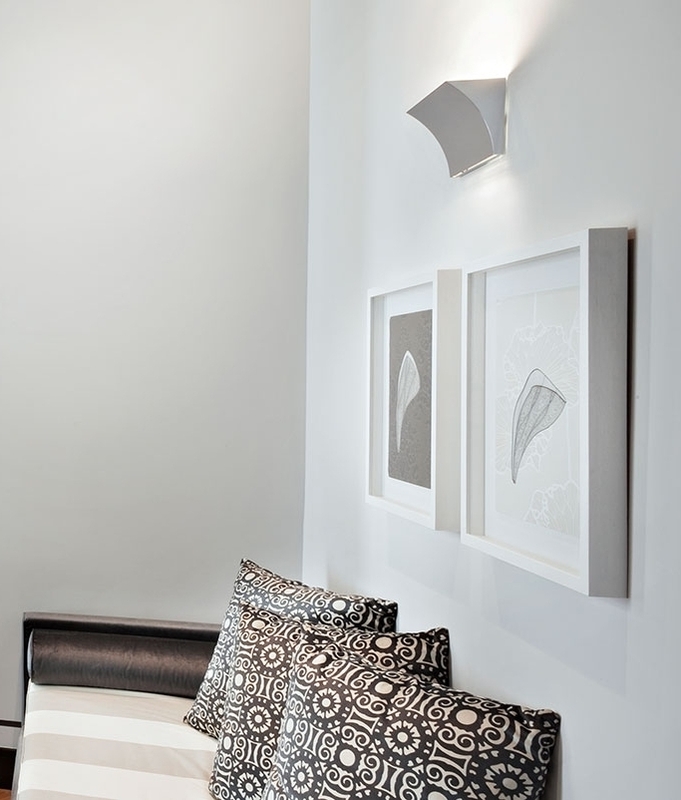 An elegant curved wall light that looks great and functions beautifully. Base material is die-cast Zamak alloy with either a semi-gloss paint or an electroplated chrome finish. Designed for R7S mains lamps (116mm) up to 160w. Also now available as an LED option, 144 x LED 20W 2700K 1707 lumen and 36 x LED 1.5W 2700K 37 lumen. Does this light shine up and down and can the bulbs be seen. I am looking for a light going on a wall up along stairs and hence the fitting will be seen from upstairs. Most up and down lights have a visible lamp that can be seen from the top, the reason they don`t place a piece of glass or something is due to heat build up this would bring. The light does shine up and down. Can you please provide wiring details for this Pochette up/down wall light? The Pochette is a class 1 product and requires an earth. 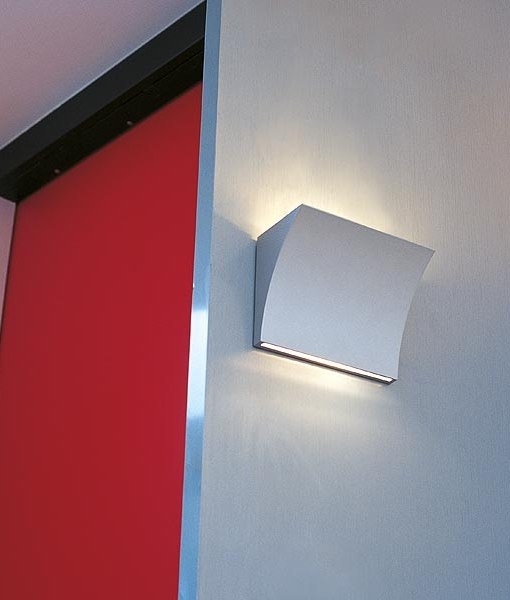 The wall light is 197mm wide and 145mm high. The cable entry is just off centre. For exact details mark the centre of the rectangle on the wall. Measure 10mm to the left of the centre and make a mark. Measure 10mm up from the centre and make a mark. Where these two points cross is the position of the cable entry i.e. North West of centre. I simply would like to know whether the Pochette light would lend itself to be used in a bathroom in zone 3? Yes the Pochette can be used in zone 3 in a well ventilated bathroom i.e. a bathroom or shower oom with an extractor fan. However if you have condensation running down the walls you may want to use something with a higher protection against dripping water. Is there an emergancy version of the Pochette Up/Down Wall Light ? The housing of the Pochette isn`t big enough to hold the battery, inverter and relay. If you need an emergency version you will require a remote battery pack - contact us for more details. Note only fluorescent version that is suitable for conversion to emergency maintained.